We started out with the sad announcement that tonight would officially be Kat Klockow's final Official Stint as a co-host for the show, her artwork and being a guests at conventions and travel thereto becoming more and more pervasiVe. Nemathena grew up in North Carolina, and now is in gorgeious Sedona Arizona, in which, staying at the super pleasant , I spent a weekend with a previous girlfriend for a metaphysics workshop in the late 1990s, during which we hike/climbed famous Cathedral Rock. Nemathena is trained in kundalini energy, and Reiki training; she discssued the Seven Rays, a la colours of the Chakras. Ceiling Cat Barbara Duncan reported our having listeners tonight in the US, the UK, Canada, Singapore, Costa Rica, and Unknown. Nema spoke about the show Dead Files, filming where she worked, and where she'd had her own experiences with ghosts still within the place. Nema teaches Reiki, attunements, etc. She explained the distrinctions between the sorts of kundalini energies. Kat re-announced, for those who came in late, that tonight was her final show as Official Co-Host. Henry conveyed that next week our guest would be Mike Stevenson. My website's Paranormal View hub page, at which one can find the show's respective report pages and archived podcasts. 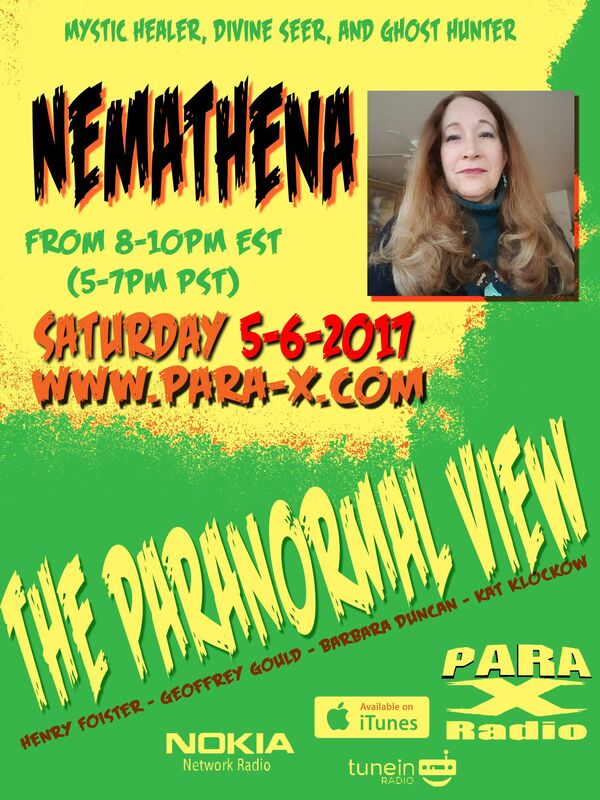 06 May 2017 The Paranormal View.